Both boys are home from school today with a stomach virus. I'm not going to tell you about how many loads of laundry I have done as a result. I'm not going to talk about how many Clorox disinfecting wipes I have run through. And I'm not going to even mention the word vomitorium.You should look that up. Really, it's not what you think. What I am going to tell you is that I noticed something today that has been staring me, so to speak, in the face for weeks and I only now recognized it. I guess being cooped up in the house today with all the bleach fumes has enhanced my perception. See, back in December, Son#2 made a gingerbread man at school. 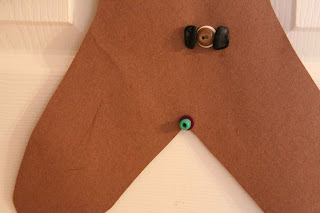 A big brown construction paper cut-out one that he and all the other first graders decorated to their own liking. 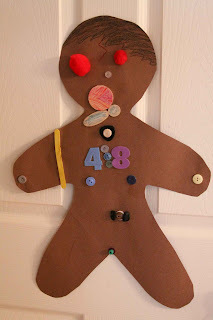 Gingerbread Man came home from school and was prominently displayed on a door in the kitchen where all current and highly prized artwork goes. 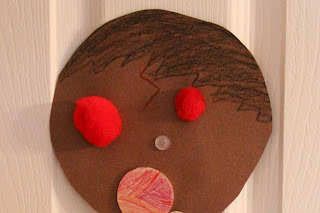 We all oohed and aahed over the detail and choice of embellishments that our creative son chose. We noticed right away that this Gingerbread Man was an amalgamation of things that our son was obsessed with way back in December. He is fashioned after Harry Potter, sporting the infamous lightning-shaped forehead scar. And he is a Cub Scout. You do see his uniform, right? We didn't either at first. But anyway, back to my eagle-sharp perception. It's perfectly positioned and was clearly placed with intention. I should have known! I'll say it again, Gingerbread Harry the Scout is an amalgation of things that our son is obsessed with. (Can you read the meaning here?!) I guess this obsession starts earlier than I thought. Oh well. 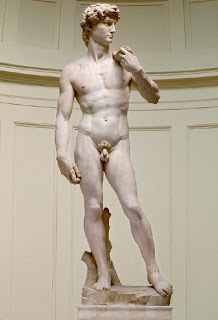 Maybe this is how Michelangelo got his start. oh this was too funny! Hope everyone feels better soon...Tim is supposed to go to Greenville tomorrow to get Maggie's car...hoping the weather cooperates. That's hilarious! I'll have to keep a close eye on Marlon's art projects to read between the lines...or legs! -Marilyn L.
I am cracking up. I have two boys - so I can totally relate. That bead...oh I am still laughing...and now going to check out the artwork on our kitchen doors. Oh my gosh. That is HILARIOUS! Seriously! How cute. He is observant for sure. I can honestly say I have NEVER seen a gingerbread man with one of those! Haha!! I didn't notice the thing the first time around, but that is SO precious! LMAO that is too funny! I didnt notice it in the first picture either. Kids do/say the darndest things you know!